"To understand the structure of the human soul we must understand the structure of society; to understand the structure of society we must understand the structure of the human soul." "To construct soaring vaults out of concrete, to face them with brick, to create windows large enough to dematerialize the wall - to do that at this kind of scale is an incredible architectural feat." "In our collective cultural consciousness, whether we like him or not, we tend to think of John Milton as powerful." "The moral dilemma is to prevent big, bad things from happening, and that takes a sort of entrepreneurship and big thinking to manage." "Hemingway, Fitzgerald, and Faulkner are the iconic figures of American Literature." 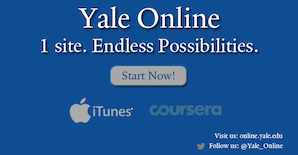 No course credit, degree, or certificate is available through the Open Yale Courses website. However, courses for Yale College credit are offered online through Yale Summer Online including OYC professors John Rogers and Craig Wright." We welcome you to explore Open Yale Courses where you can discover a wide range of timely and timeless topics taught by Yale professors, each with a unique perspective and an individual interpretation of a particular field of study. We hope the lectures and other course materials, which reflect the values of a Yale liberal arts education, inspire your own critical thinking and creative imagination. We greatly appreciate your enthusiastic response to this initiative and hope you will stay in touch!